The Fujifilm FinePix Z70 is a style-focused ultra-compact digital camera with a 12 megapixel CCD sensor, a 2.7 inch LCD screen and a 5x optical zoom lens (36-180mm focal length) with a sliding cover. For movie makers the Z70 has the must-have feature of 2010, high-definition 720p video recording at 30fps, with the welcome ability to use the 5x zoom during recording and a handy one-touch record button. Easy uploads to Facebook/YouTube, ISO 100 up to ISO 1600 at full resolution, Tracking Auto Focus, support for SD/SDHC memory cards, and an Automatic Scene Recognition mode for beginners complete the Z70's main specifications. 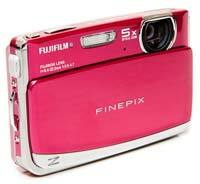 The Fujifilm FinePix Z70 costs £129.99 / $149.95 and is available in black silver, red, blue or purple. 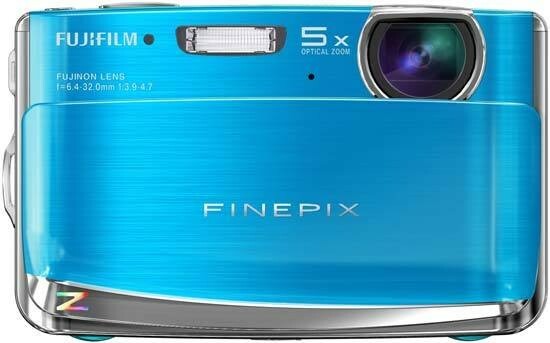 The Fujifilm FinePix Z70 is a small and slim metal-bodied point and shoot camera with a sliding cover that protects the lens and also turns the camera on and off. It's cheaper than its build quality and good looks would initially suggest, at £129.99 / $149.95 costing a lot less than other fashion-orientated snapshot rivals. Size and pricing aside, this 12-megapixel camera is as much about user friendliness as creative flexibility. For those with kids or subjects that don't stay put its auto focus tracking ability will doubtless come in handy, as will the 5x internal zoom lens, which provides a focal range of 36mm wide-angle to 180mm telephoto. Given the telephoto lens reach of 180mm, image stabilisation is a welcome inclusion, albeit a less effective digital system which increases the ISO speed rather than the more advanced CCD-shift anti shake found on other models in Fujifilm's extensive range. In practice therefore with the Fujifilm FinePix Z70 it's mostly a case of a half press of the shutter release button and the camera does the rest, particularly with Fujifilm including an 'auto everything' scene recognition (SR) auto mode. Although far from infallible - if you're not paying close attention and it's presented with a busy scene it'll call up landscape when macro is needed and vice versa - it adds to the beginner-friendly feel. The Z70 introduces high-definition video for the first time to the Fujifilm Z-series, capturing 1280 x 720 pixel footage at 30fps with mono sound, full use of the 5x zoom and a maximum recording time of 15 minutes per clip. 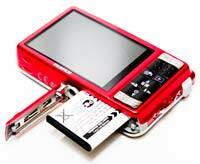 Alternatively there are also 640 x 480 pixels and 320 x 240 pixels modes, also at 30 fps. Although there's no built-in HDMI port, you could use Fujifilm's optional HD Player Kit instead, which includes an HD card reader that connects the camera to your HDTV, and even a wireless remote control. The in-camera Movie Edit function allows you to make your movies black and white, sepia or even add backlight correction to correct the exposure. Given its beginner market the Fujifilm FinePix Z70's buttons and controls are for the most part large and sufficiently self-explanatory that the manual - a full version here on CD only - doesn't need to be digested before you're up and shooting. As for the remainder of the box contents, you'll need to supply your own SD, SDHC or SDHX card for image storage. When turned off the front of the Z70 looks very minimalist, with the lens and other controls safely hidden away out of sight. Slide down the lens cover and the fixed internal lens is revealed, which doesn't extend from the camera when zoomed. It offers respectable enough maximum apertures of f/3.9 at 36mm and f/4.7 at 180mm. To the left the lens are the integral flash unit and an activity LED. Note that there's no hand-grip on the front of the Z70, which does make it a little tricky to hold. The sliding lens cover also acts as the On/Off control, with the Z70 powering up in around 2 seconds - pretty quick for this class of camera - and the rear LCD displaying a Fujifilm logo initially before blossoming into life. The Fujifilm FinePix Z70's top plate houses the large and tactile shutter-release, with a definite halfway point so that a premature capture is avoided, the camera giving an affirmative 'beep' when focus and exposure have been determined and the AF point highlighted in green dancing around the screen if either your camera or subject is moving. To the right is a small but welcome Movie Record button, making it quick and simple to begin shooting the aforementioned 720p HD movies. At the rear of the Z70 we find the rest of the operational controls. These are well laid out and their functions ably illustrated. Starting top right of the 2.7-inch, 230k-dot LCD screen, there's a fairly responsive thumb-operated zoom button, with the camera taking just under four seconds to move through the range from maximum wideangle to telephoto. Full resolution JPEG images are saved almost instantaneously when shooting in single shot mode, so no complaints there. Underneath is a ridged area where your right thumb naturally sits when holding the camera, and underneath that is a button for marking a file for upload to Facebook or Youtube, which is only operational when you use the Playback button on the right. Immediately below this again we have a four-way control pad. Placed at the four points are icons for deleting images and setting the exposure compensation, choosing the flash mode, the various self-timer options, plus macro and super macro settings. A button for cycling through the various LCD display settings, turning off the visible icons on screen and/or calling up a nine zone compositional grid when in capture mode, and a familiar menu/OK button complete the rear controls. Press the Fujifilm FinePix Z70's menu/OK button in anything but auto mode and you're presented with two clearly read screens of shooting options when in capture mode or review mode (if shooting using one of the auto settings, options are abbreviated to turning self timer or high speed shooting on or off, plus access to the set up menu). The set up menu itself is divided into three folders allowing the adjustment of operational volumes, screen brightness, and the ability to format the inserted memory card or internal memory. The Shooting Mode menu option provides a list of all the various modes. Starting with Program, the shooting mode with the largest amount of configurable options and then full auto mode, we then come to one of the camera's main selling points, the aforementioned SR (Scene Recognition) auto, which cleverly chooses the most applicable scene mode 80% of the time. Next up are two modes for improving low-light photos. The Natural Light mode forces the Z70 to select a fast shutter speed in order to freeze subject movement more effectively, whilst setting a fast ISO speed without firing the flash for more natural results. It's an effective automatic way of taking photos of children indoors, for example. Natural Light and Flash is a little more exciting. When selected, the camera instantly takes 2 photos, one with flash, one without, giving you the option of which one to choose later (both are saved by the camera). Finally an extensive range of scene modes feature standard pre-optimised settings for familiar scenes and subjects, including portraits, landscapes, sunsets and fireworks amongst its selection. Face detection, which biases the focus and exposure toward any faces in the frame, is also activated in the main menu system, as is the Red Eye Removal setting. Fujifilm have chosen the more widely available SD than retaining historical loyalty to the now outgunned (in terms of available capacity) xD-Picture Card, a slot for which is provided at the base of the camera where it's shared with the lithium-ion battery required for power. This means that if you're shooting with the camera on a tripod via the plastic mount, you have to first remove the camera to remove the card, which is a bit of a pain but far from uncommon. The right hand flank of the Z70 (when viewed from the back) features a rather incongruous grey rubber flap covering a combined AV out and USB port, below which is a metal eyelet for attaching the provided wrist strap. There are no controls on the left hand flank.